i thought i heard that mixing pills causes loss of memory, but i forgot. Now, if you can invent the Common Sense pill I need a few scripts. They would make great holiday gifts for all my loved ones who just don’t seem to get it. You will know who you are after taking the first one. the best i can do for you is some calm incense… but definitely doesn’t work as well as the anti-anxiety meds. 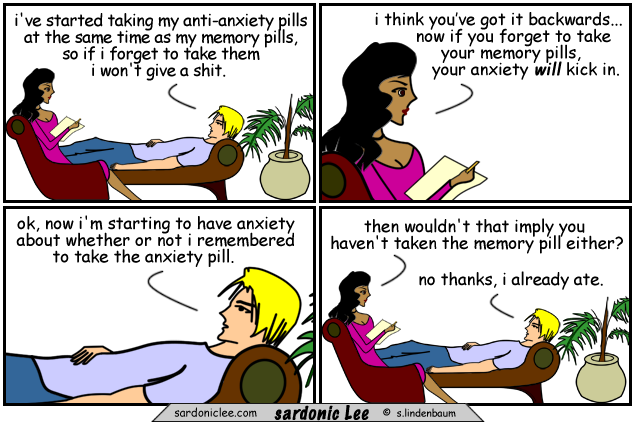 I was gonna write something…but I’m afraid I forget what it was…..
Hopefully, not taking the memory pill will make you forget about the anxiety as well. If I remember correct-Lee, with therapists it’s always pay me now, pill me later!